Last weekend I did something which I’ve been planning for a while. Something which I’ve kept secret from family and friends, except those closest to me. It’s been difficult for me to talk about because I’m afraid people might think that I’ve become a nerd-girl. But now I’m just going to out myself. OK, here goes…I’ve joined a tramping club. There, I said it. That’s not a trampolining club by the way. I don’t think anybody would let me in their trampolining club. I’d only do about five bounces then run out of puff and feck-off. No, ‘tramping’ is Kiwi for rambling. So yes, my friends – I have joined a rambling club. I joined because I thought if we’re only in this country for a limited time, I damn well want to do some walking and see some of its great outdoors. Yes, we can do little ambles with the kids but its not the same. And yes, I may in time make friends who I could go out tramping with but I want to do some now. So when I saw a poster in the library for the Women’s Outdoor Pursuits Society or WOPS, I thought hey, I’m a woman and I like the outdoors – maybe that’s for me! I went home and keenly looked-up WOPS online. Photos and videos of recent tramps assured me that the society would take me to some beautiful places, all in and around Greater Auckland. Yet as I scoured the images I don’t think I could find a face of anyone who looked under 45 and many seemed a lot older. The FAQs confirmed that most ‘WOPERS’ (teehee) are in their 40s, 50s and 60s. Ah well, I thought – just four months until I join that age-bracket, I’ll give it a go. But getting in was not straightforward. To join I had to complete a two day course – one day in a classroom and the other on a tramp, which is what I did last weekend. I’m not sure what I expected from this – perhaps advanced compass-reading or tips for keeping your kendal mint cake dry. The reality was that WOPS seem to want to check that applicants are capable of putting one foot in front of the other and sporting a kagool before they’re admitted to the club. I’m being a bit unfair, much of the course was on safety. How not to get lost and what to do if you do, including how to fashion an emergency shelter out of leaves, which was quite cool. Tramping safety is taken pretty seriously here, as there are often stories in the news of daft folks, usually tourists, who have ventured up the wrong track, with the wrong kit and ended up dead of hypothermia or swept away by a fast-flowing stream. The glib part of me (which has previously written about Kiwis making exaggerated claims about risks) is inclined to think that, because of the absence of proper news stories maybe you are more likely to hear about walkers’ mishaps here than you are about people falling off mountains back home. But I decided now was not the time to be glib but instead to take on board what my capable WOPS-leaders were telling me, after all, I don’t fancy getting lost in the woods. A great deal is made by the New Zealand tramping community about kit and having the right clothes. Olly and I discovered this when we were in New Zealand back-packing a few years ago and walked the Kepler Track, one of the county’s nine ‘Great Walks’. It’s a three day tramp on the South Island, which took us high into the mountains. When we booked, we were bombarded with info about what we could and couldn’t wear. Jeans and cotton tee-shirts were out. Merino and manmade wicking garments were in. Plus we had to have hats, gloves, walking boots and a proper raincoat with hood. Olly and I were backpacking round the world at the time and had none of this stuff. We had trainers, ludicrously heavy backpacks and an irrational dislike of outdoor-wear. Use the Force Em. 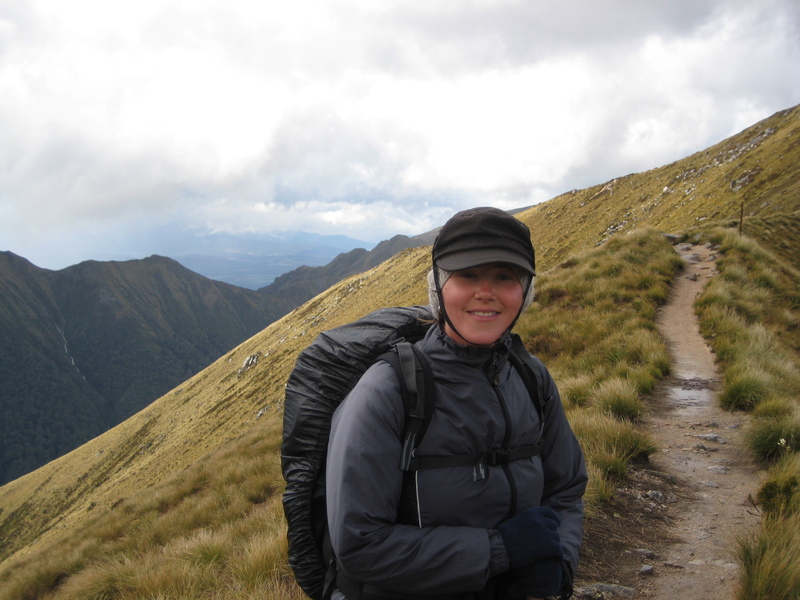 Me on the Kepler track in 2008. On the second day of the trek we had to sneak past the Department of Conservation warden who was checking everyone’s clothes before allowing them to embark on the alpine stretch of the walk in a storm. We were wearing socks on our hands instead of gloves and plastic bags between our shoes and socks. I also had two hats (neither of them waterproof) ratchet-strapped to my head, making me look not unlike one of the rebels in the Empire Strikes Back. Since then, I’ve matured and accepted that it might be wise to wear proper outdoor clothing for walking, so listened intently on the first day of course when clothing was covered. 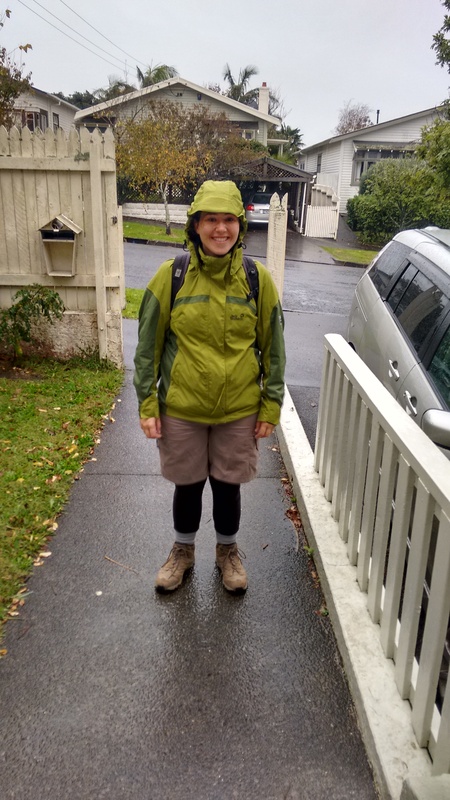 I was surprised when Claudia, one of our leaders, said that she rarely bothered with waterproof trousers and braved wet-weather in just shorts. The checklist, provided by the trainers suggested that thermal long johns could be worn underneath shorts in cold weather. As some of my girlfriends back home know, much to their hilarity, I own some thermal leggings made from bamboo, so decided to give the shorts-long johns combo a go, without waterproofs, just like a roughy-toughy Kiwi. The night before our induction tramp, I scurried about the house, trying to tick-off the other things on the compulsory check list. Whistle – check! Packed lunch – check! Extra snack – but of course! Survival blanket – err, well, never mind, maybe next time. I was packed and ready to go! Who are you calling nerd-girl? Now, earlier posts in this blog may have had you believe that New Zealand was the land of endless sunshine. Indeed, for the first four months of our stay it was. Now it is quite different. It’s quite wet. Actually it’s more than quite wet. It really bloody-well rains here. Like one minute it’s dry and the next, a huge amount of water is falling out of the sky, often with very little warning. And on the day of our tramp, it pretty much rained all day long. But did I tog-up in my waterproof trousers? No sir, I did not. I was not going to be a namby-pamby Brit. I was going to tough it out in my super-wicking shorts and long-johns – even when it turned out that most of the other ladies on the tramp were in waterproofs. And guess what? I got soaked. And quite chilly. It didn’t help that my boots seemed to fill with water too. Thanks Gor-Tex. I’d have been better off with plastic bags on my feet.